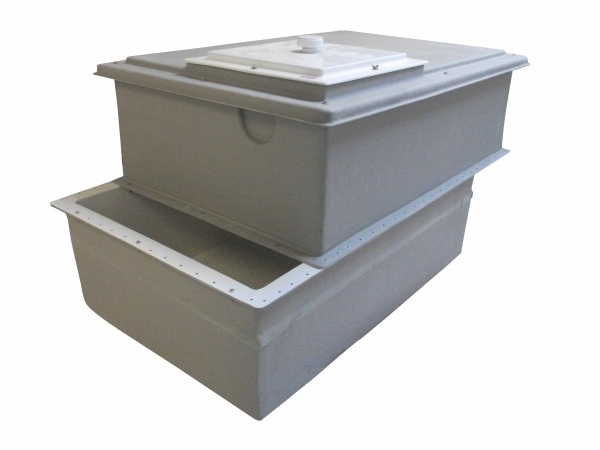 Take a look at our range of GRP two piece cold water storage tanks manufactured from WRAS approved GRP materials. Comprising of an upper and lower section assembled at the mid section horizontal joint flange, in effect a one piece tank supplied in two sections to allow lifting and positioning through doors and similar access restrictions. Assembly instructions, joint flange sealant and fixings are provided. Close fitting and sealed lid which is removable for maintenance. CFC free PU foam insulation is completely encapsulated within the GRP laminate. Comprising an upper and lower section of equal height incorporating an external horizontal joint flange allowing the sections to be bolted together on site. Tanks storing over 1000 litres nominal have an access man-way with removable lid providing a 520 x 520mm opening, allowing access for maintenance and inspection. For further information about any of our GRP two piece water tanks, get in touch with us today. Contact us by phone on 0121 323 4000 or send an email with your enquiry to solutions@purewaterstorage.co.uk. Alternatively, you can reach us by sending a quick note using our online contact form. *Note - WRAS approved tanks are to a max of 23°C for potable water.